FileBoss is the robust and powerful and friendly file manager for windows that tames today's large and complex Windows' file systems. With a large set of tools to help keep files and folders in order, FileBoss is a must have for anyone who works directly with files - from avid Windows users to corporate system administrators. FileBoss has the most complete file management toolset on the market today to solve most any problem you may have with your files and folders. See FileBoss vs Windows Explorer. (FACE) ensures fast, accurate, flexible and easy file copying, moving, duplication, backups and much more. FACE will never quit just because it can't copy one file. For more see Copying Files. FileBoss can rename one file or thousands most anyway you want. The rename routines are the easiest and most flexible around. Each file can be individually confirmed (and, of course, changed before renaming) or you can tell FileBoss to just to do it all without asking again. And it can even rename recursively through folders. For more see Renaming Files. When you need to find files use one of FileBoss's dedicated find routines. From finding files that were modified this morning to files that have long names or paths FileBoss has a way to find the files you want. For more see Finding Files. 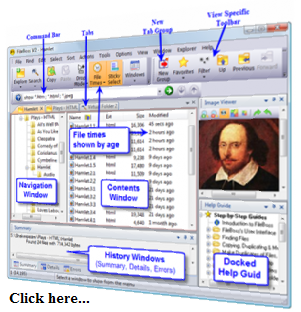 FileBoss's intuitive, configurable interface enables you to view your files in meaningful ways. And by using multiple tabs and tab groups, FileBoss can adjust its views to what is best for you at any given time. Check out the short FileBoss Tour. From copying files to deleting them, from cleaning folders to concatenating files FileBoss's extensive toolbox helps you keep you file system and computer running at their peak. Try FileBoss today to see its power (and its beauty) for yourself. Whether you are currently using Windows Explorer or some other file manger find out what FileBoss can do for you. Going far beyond the old dual-pane, Norton style file managers FileBoss was designed from the beginning to handle today's large file systems and the needs of modern computer users. Check out the PDF Getting Started manual. Good for new and experienced users alike. Get yours here Getting Started.